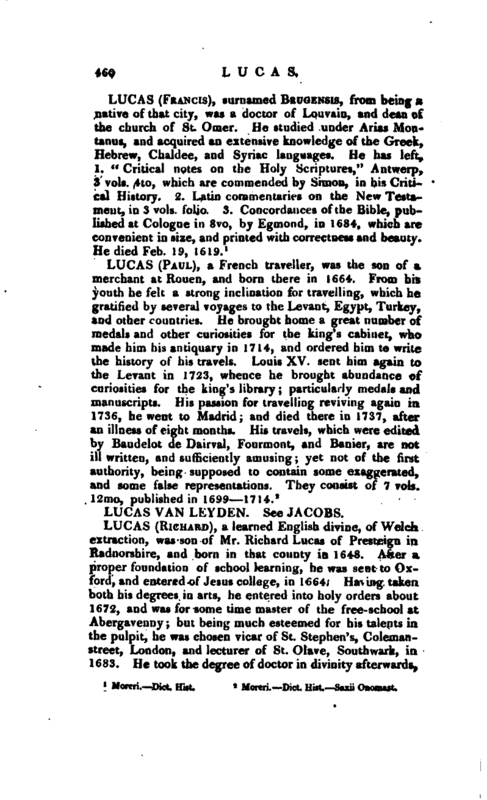 , a learned English divine, of Welch extraction, was son of Mr. Richard Lucas of Presteign in Radnorshire, and born in that county in 1648. After a proper foundation of school learning, he was sent to Oxford, and entered of Jesus college, in 1664. Having taken both his degrees in arts, he entered into holy orders about 1672, and was for some time master of the free-school at Abergavenny; but being much esteemed for his talents in the pulpit, he was chosen vicar of St. Stephen’s, Coiemanstreet, London, and lecturer of St. Olave, Southwark, in, 1683. He took the degree of doctor in divinity afterwards, | and was installed prebendary of Westminster in 1696. His sight began to tail him in his youth, but he lost it totally about this time. He died in June 1715, and was interred in Westminster-abbey; but no stone or monument marks his grave. He was greatly esteemed for his piety and learning, and his writings will preserve his fame. He wrote “Practical Christianity;” “An Enquiry after Happiness;” “The Morality of the Gospel;” “Christian Thoughts for. every Day of the Week;” “A Guide to Heaven;” “The Duty of Servants;” and several other “Sermons,” in five volumes. He also wrote a Latin translation of the “Whole Duty of Man,” which was published in 1680. 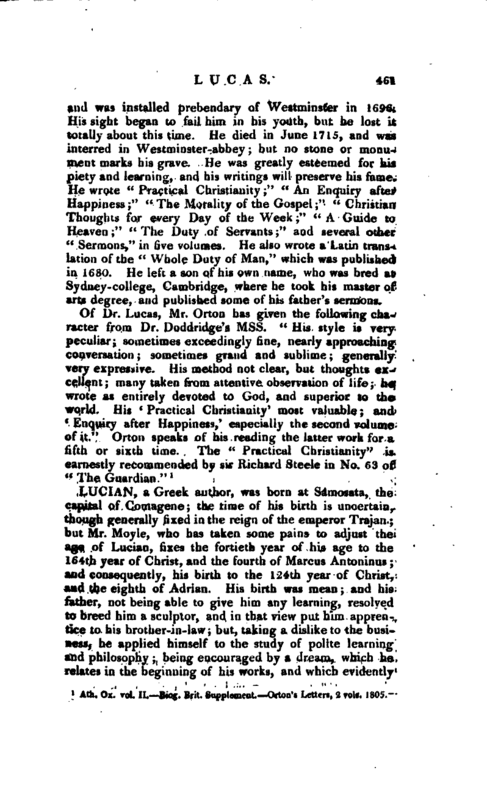 He left a son of his own name, who was bred at Sydney-college, Cambridge, where he took his master of arts degree, and published some of his father’s sermons. Ath. Ox. vol. II. Biog. Brit. Supplement. —Orton’s Letters, 2 vols. 1805.